SDK for creating MetaWear apps that run in the Apple ecosystem. This is a thin wrapper around the MetaWear C++ API so you will find the C++ documentation and API reference useful. MetaWear is a complete development and production platform for wearable and connected device applications. MetaWear features a number of sensors and peripherals all easily controllable over Bluetooth 4.0 Low Energy using this SDK, no firmware or hardware experience needed! The MetaWear hardware comes pre-loaded with a wirelessly upgradeable firmware, so it keeps getting more powerful over time. Apple ID, you can now get started for free! Once you are ready to submit an App to the App Store, you need a paid Apple Developer Account. The iOS simulator doesn’t support Bluetooth 4.0, so test apps must be run on a real iOS device which requires a developer account. 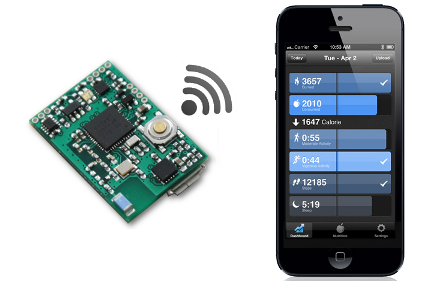 Bluetooth 4.0 available on iPhone 4S+, iPad 3rd generation+, or iPod Touch 5th generation. For first time CocoaPods users we have a detailed video guide. Here is a walkthrough to showcase a very basic connect and toggle LED operation. // Hooray! We connected to a MetaWear board, so flash its LED!